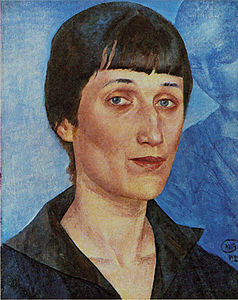 Portrait of Akhmatova, by Kuzma Petrov-Vodkin; image care of Wikimedia Commons. If last week’s dose of pub-lit was a long and thoughtful rumination on the mythic breadth of history, then this week’s takes us on a chilling turn to Russia in the midst of a dark poetic winter. Few places, I think, have as unique an engagement with poetry (or literature in general) as Russia. While all nations have had their historic drifts between passions and themes, few can claim to have gone through a period of such rigid and destructive clamp-down as they. The period I speak of is, of course, the time of the Soviet Union. While I seek to make no political judgements here, I do feel right in making creative ones – and I think our spotlighted poet tonight, one Anna Akhmatova, would feel justified in doing so as well. On the one hand, she befriended such other writers as Boris Pasternak. Yet she also lived through World War II, and the madness of a 900 day siege in the city of Leningrad. She married three times, divorcing twice, and losing the third to the horrors of a labor camp. And that was what sadly came to define her life: horror. She watched as friends and family died, fled, or were executed – yet she remained. Her work was condemned by the government, but still she remained, choosing to remain as witness to the horrors around her. And her work changed with them. What was short and musical twisted into intricate and structured tragedies – like the piece we present tonight. “Poem without a Hero” was originally dedicated to all those friends and countrymen that died at Leningrad (St. Petersburg). Though it was not published until after her death, Akhmatova began it in 1940, and proceeded to work on it for twenty years, considering it the major work of her life. Today, it is one of her longest and most well known works, and regarded as one of the finest poems of the twentieth century. The translations, given below, were performed by Stanley Kunitz and Max Hayward. one by one, to hallow this night. I wait the birth of the year. though the hour has not yet struck. or the tread of the Man in the Iron Mask? I am more iron than they. till the Day of Judgement. Are the last days near, perhaps? but you haven’t forgotten me. a terrible festival of dead leaves. who could not enter this white hall. his warm hand makes a human pledge. turning left from the bridge? whose feigned groans cannot take us in. You write laws of iron. what have poets, in any case, to do with sin? or die! But what am I trying to say? I’ll leave it to others to explain. that suddenly flitted past my window? between the stove and the cupboard? and granite is softer than wax. or change into another person. why do you beckon me with your hand? I would give the peace of the tomb. At the risk of sounding crotchety, I actually think it’s okay to make some political judgments here–what Akhmatova and Mandelstam and other poets went through on the political side was horrible. I agree she’s a great poet. It’s incredibly difficult to imagine how these people survived at all–often memorizing all their poems because they were afraid to write them down (and have them found.) I guess, I should say that it’s amazing that the work survived–except that it’s so good, and was so important to people. Thanks for bringing her up. I should read a lot more of it. Oh you’re not being crotchety my friend. I perhaps could have worded that all better – I certainly agree that what they went through, what so many people went through in their nation at that time was an absolute horror…I merely meant that the political side of things was not the focus of this article. It was the person, her struggles, her story, and the work that came of it, that was the focus. Yes, I knew you didn’t mean it that way. But thanks for focusing on her. I really should read more of Akmatova and the others too. The one you posted is great, but I tend to like shorter works better, because ot my own limitations–I can understand and absorb them better. K.
I agree. I am in awe of people who can say masses in few words. this is a fascinating article chris.. business-wise i was lucky to meet the one or other russian and they’re fascinating people with a different view on life and much depth. enjoyed your spotlight on anna very much and this poem sure is a masterpiece in many ways. thanks chris for the awesome work you’re doing with pretzels & bullfights – really broadens my horizon.. Thank you for sharing! I have enjoyed reading your article! The poem is really wonderful; now I would like to read more of her works! Dark, heavy stuff, Chris. For me, it illustrates how poetry is born of a socio-political structure, and, perhaps, how it can influence it. Interesting also how the cold, dark climate impacts the writer. On a side note, Stanley Kunitz was one of my all-time favorite poets. I didn’t know he was involved in translation as well. An extraordinary human being. Such a heroine she was! I am glad of the opportinity to read this wonderful and disturbing poem. I wonder how huge a treasury of Russian poems we have yet to encounter, both old and new… I really enjoyed reading this, and I LOVED the poem. Thank you, Chris for introducing me to this remarkable Russian poet. Yhe background you give us throws a whole new light on the poetry of that time and place. Thanks Chris. Up until now I have been familiar with the poets whom you’ve posted. I can read French enough to understand the poetry of it without too much aid of translation and almost can manage the same in Spanish. I took one semester of Russian in college and got through the alphabet, numbers and days of the week which doesn’t help much at all. So much of poetry is in the layering, in the nuances (at least in my work I hope it is) so I’ve not read any Russian poetry. Of course I am acquainted with the masterpiece novels but I have known nothing of their poetry. Like Claudia I have several Russian friends and they are passionate about poetry. I think they have the same difficulties with ours. It’s almost unnoticed how much of a nation/culture’s history and sacrifice is inherent in its language. They don’t understand English speaking cultural references and I think the same for English readers of theirs. Having said that, I found the above piece profound and deeply personal. Thank you for introducing me to her! Gay, if you like French music, you’ll have to given a listen to the playlist on my blog. It features a few blow-your-mind songs in French. I think you’d enjoy their soulful dance. This is tremendous! Thanks for the wonderful article and the translated poem. I am always suspicious of translations — one never knows (unless one speaks both the source and target languages) what was left out and/or what was added. One also deals with a potential loss of musicality and watering down of original poetic devices. (No rhymes or fixed meter here but translation of non-free verse poems almost always sacrfice some level of quality, not matter how skilled and poetic the translator is.) That said, this reads very nicely and I think it’s likely that much of the intent came across nicely in the translation. Thanks Chris–she is one of my favorite translated poets, and she translates well,, because she is so clear and passionate, I think. She had a very hard life, watching all her personal world destroyed. She began writing in a literary golden age, and had to see all that destroyed also, yet she persisted. Thank you for highlighting yet another author more people should read, and I should read more often. This is exciting and I love it when this happens. Somehow I missed this post but today while researching a poem I want to write on value pluralism I found a connection between Isaiah Berlin (a magnificent philosopher) and Anna Akhmatova. This lead me to look for a version of Poem Without a Hero on the web and here I find it in my poetic home away from home! Thank you Chris, you made my day!